Even after extending the day shift, Suffolk-based subcontractor CTPE was still having difficulty producing aluminium covers for a medical housing in two operations quickly enough on an ageing, 40-taper, 3-axis machining centre after the customer raised the call-off rate to 100 per week. A new production route proposed by Whitehouse Machine Tools based on the supply of a Japanese-built 30-taper machining centre from Brother, also a 3-axis model, promised a halving of the cycle time and consequent elimination of the problem. So a Brother S700X1 was installed in August 2016. Whitehouse edited the existing program and, although it is still a two-operation job, the cycle time was indeed reduced by 50 per cent to one hour, as had been demonstrated during time trials in the supplier’s Kenilworth technical centre and showroom. The saving is principally a consequence of four times faster tool change at 1.4 seconds, a 16,000 rpm spindle with through-coolant rather than the 6,000 rpm of the previous machine, four times faster acceleration at 2g to linear rapids of 50 m/min instead of 18 m/min, and the fact that the program runs so much faster in the latest Brother CNC C00 control. Since the machine was installed, CTPE has gone a step further by optimising the program to machine six parts on the table with 14 tools and adopting new types of cutters. The effect has been to reduce the cycle time per part further to just 30 per cent of the original. 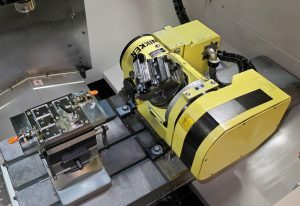 In another example to demonstrate the magnitude of the savings obtained, an aluminium flow housing for a customer in the scientific sector was previously produced in three operations on a 3-axis machine in 15 minutes and is now produced in an Op1/Op2 cycle on an S700X1 in six minutes, representing a 60 per cent time reduction. 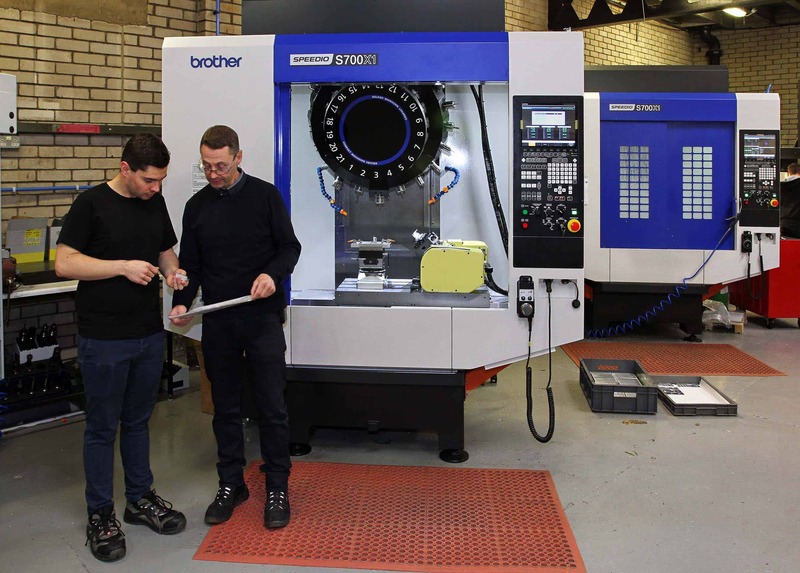 Alex Taylor, who runs the subcontracting firm in Mildenhall with his father Chris, commented, “It was our first machine from Brother and also our first 30-taper capacity. “We were impressed with the quality, compact footprint and speed of the Japanese machine when we saw it in Kenilworth and comments about Brother both online and by word-of-mouth were complimentary. 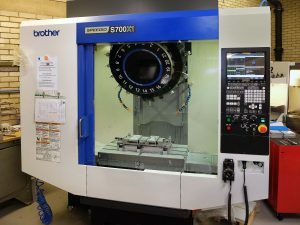 Such was the success of the project that, when a second multinational company in the medical sector, a long-standing CTPE customer, asked for a new family of 6061 aluminium parts to be produced, Chris and Alex Taylor had no hesitation returning to Whitehouse for an identical S700X1, this time fitted with a 2-axis Nikken table. It replaced another 3-axis vertical machining centre in June 2017. The parts were being machined in the USA but the German-based OEM wanted a single source of supply and was confident of the Suffolk subcontractor’s capabilities. Six components are required, half of which are suited to 3-axis metalcutting while the others benefit from five-face machining in two operations using 3+2-axis cycles, as otherwise they would need eight set-ups on a three-axis machine. Chris Taylor said, “We like the 3-axis Brother and 2-axis Nikken combination, as we are able to mount the compound table on one side, leaving the rest of the machine table free for fixturing a second component in a vice for three-axis machining. He added that, in a similar price bracket they looked at a number of 40-taper, 5-axis replacements for their old machining centre, but they could not compete with the speed of the nimble, 30-taper machine. The smallest cycle time saving achieved to date by swapping an existing job onto an S700X1 is 40 per cent. The company has also won new 5-axis work as a result of having the capacity on the shop floor and some of those jobs have already repeated. The Brother machines are especially appropriate for CTPE, which processes a lot of aluminium. One of the new medical parts is quite large for a 30-taper machine at 180 x 50 x 50 mm but the Brothers cope with it well, despite more than three-quarters of the billet’s material being removed. Accuracy achieved is down to ± 5 microns positional tolerance, better than is possible on many 40-taper machines. Chris Taylor pointed out that CTPE also produces components in steels including stainless on the S700X1s, although a 30-taper machine would not be appropriate if one is doing that all day.